I wore this polka dot and stripes mixed print outfit on an action packed Sunday as I needed a versatile look that could take me from the flea market to church to lunch with the girls. The jeans were a casual and comfy necessity for the flea market outing while the jacket served as a conservative church cover-up. The touch of glam in the accessories was for my girlfriends as I knew they would appreciate the attention to details. All my bases were covered for my Sunday fun day! I really appreciate the inseam slits of my A.N.D. jeans as the cut elongates instead of truncating my legs as I detest the bunching up look when pairing jeans with certain heels. It's a simple design element that adds so much value to the overall look and provokes habitual wearing as I've worn them at least three times in the last two weeks. It's truly a cut above the rest. Flea hunting in heels?! Impressive pumps! Love the jeans- long, lean perfection. Nice combination of dots and stripes! OMG! Simply too fabulous my dear, this looks such a delightful contrast! Love how you matched those prints! 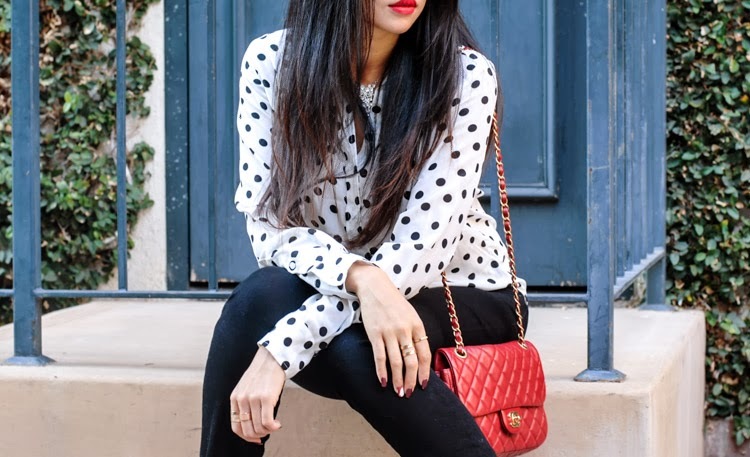 Very classy with a red lip too! Love the style :) You really got a nice blog! Keep up the good work. Please visit my site if you have time.